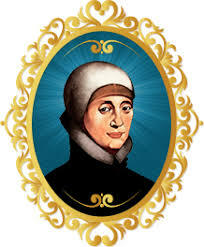 Tomorrow marks the final day of our week-long celebration of Mary Ward. We began with her birthday on January 23rd, and on January 30th, we remember the anniversary of her death. 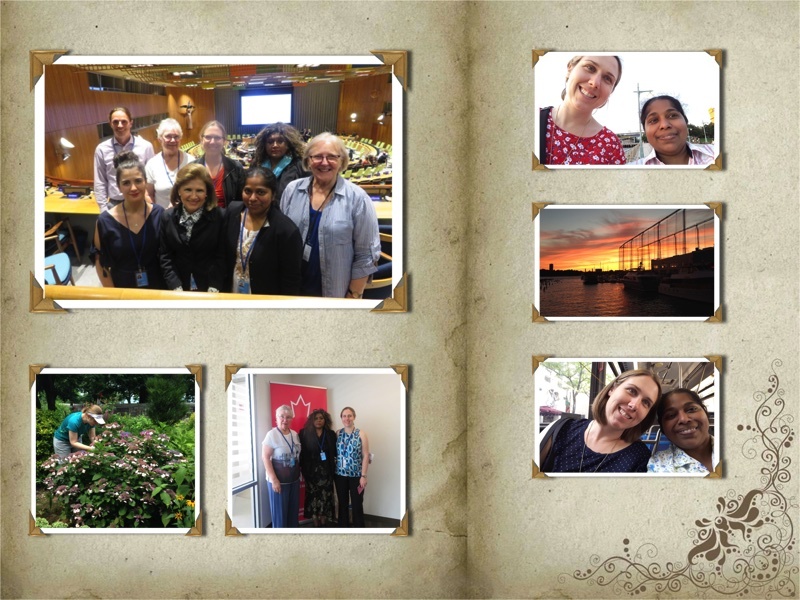 As one Institute – the Institute of the Blessed Virgin Mary and the Congregation of Jesus – we have been praying together this week with a beautiful booklet of reflections written jointly by IBVM and CJ sisters and friends. I would like to share a couple of excerpts here that continue to speak to me. 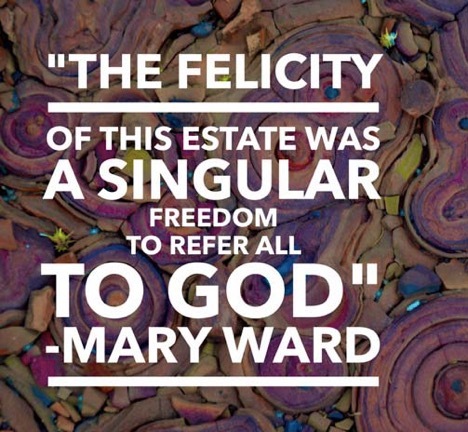 Mary Ward had free and open access to God. 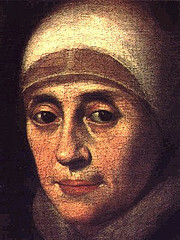 How free she was, a woman with a burning desire to follow the will of God despite her suffering. She invites us to follow her way, knowing that we are one with many companions across the world. We are all seeds which will bear abundant fruit in the places where we live. We are contemplative in action. We give and reach out more. 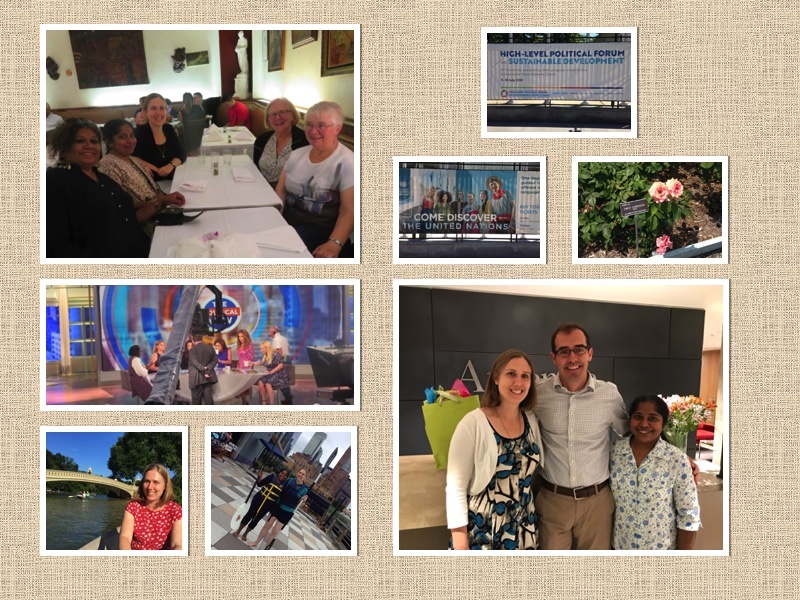 What emerged as a key element of the conference (“Friends of Mary Ward”) was the sense that we are not called to be about living in the past, but rather to be willing to embrace this new thing that God is doing in the hearts and minds of all those who love and follow Mary Ward. The virtues Mary Ward wrote about in 1615 after a very significant prayer experience are not only an ideal for sisters or women in general; they are relevant for all those who want to follow Jesus today. Mary lived out these virtues – freedom, sincerity and justice – and became for us, her companions, a vivid model and example. Even in times of trial and darkness, when her faith was put in danger by the Church’s leaders, she chose to follow the path of truth. Her attitude is a lesson for us in the 21st century. 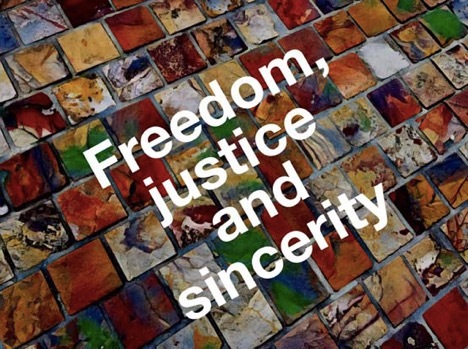 Our society needs the sincerity and transparency proposed by our founder, and as Mary Ward’s friends, we are called upon to live them in our context. 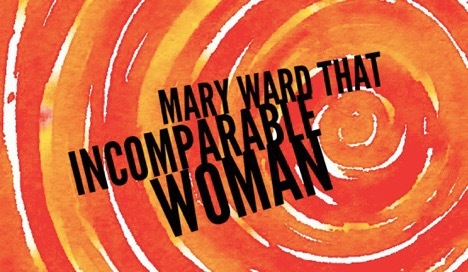 Categories: #IBVM, #MaryWard | Tags: #MaryWard, #MaryWardWeek2018, #MaryWardWomen, #ThatIncomparableWoman | Permalink. The vow of poverty is complex. I’ve been trying to think about how best to frame this blog post and I think I will have to split it up into two parts. 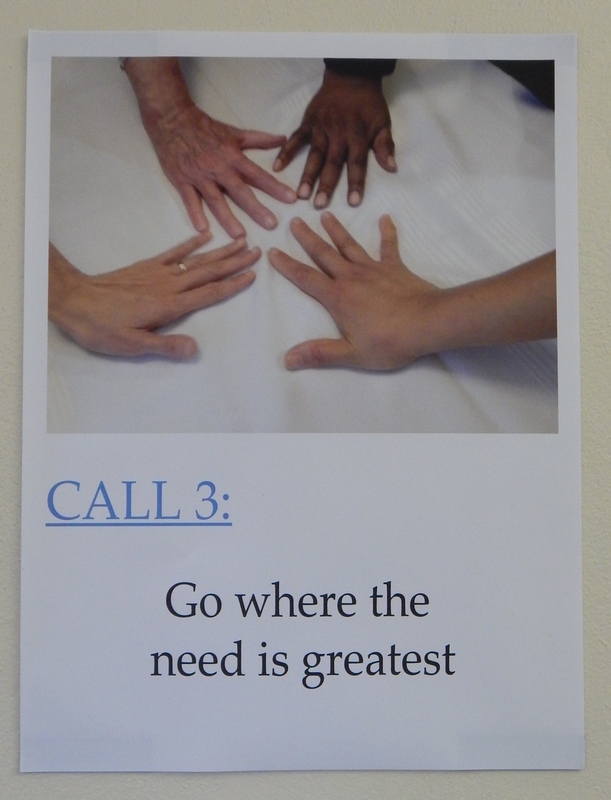 I’d like to first share what I have been learning about the vow of poverty from our in-house formation sessions and then in the second post share about my personal experiences of letting go of material goods and resources and how I have come to think about the vow for myself. In our in-house formation, Sr. Christine Burke, ibvm, has been leading us through an understanding of the evangelical vows (vows taken in religious life). She has really helped me (and my fellow novices) to think more deeply about the vows and she has guided us through some meaningful discussions. I think our most complicated discussion has been about poverty. 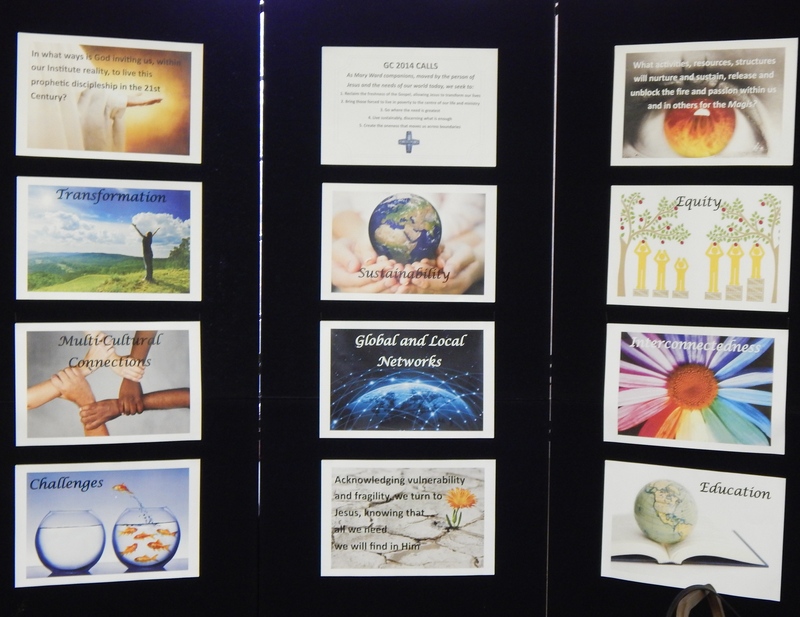 We first talked about poverty on a global scale – absolute poverty, extreme poverty, extreme deprivation. We can give it many labels. This kind of poverty is identified by a significant lack, usually of the basic needs of life – access to adequate housing, food, education, health care, employment, etc. Extreme poverty is dehumanizing. It takes away the dignity of a person and renders them invisible and voiceless and nearly always powerless. I see this kind of poverty on an almost daily basis in the Philippines and it is crushing. It is crushing to live and experience and it is also crushing to witness. This kind of poverty can seem hopeless and entrenched. This kind of poverty is a result of unjust and broken economic and social systems at the local and international levels. The Church tells us that extreme poverty is a sin. Extreme deprivation is something that we must fight against – we want people to be lifted out of these conditions, to experience life fully and equitably. Choosing to live according to the vow of poverty therefore is not about choosing a life of extreme deprivation but it is about choosing to live with less in order to give more to others. Some religious congregations live a very austere life (think of Mother Teresa’s congregation, the Missionaries of Charity) but not all are called to live like that. 4.13 God is the true wealth of the human heart. and his total gift of self to all. and our dependence on God’s provident care. 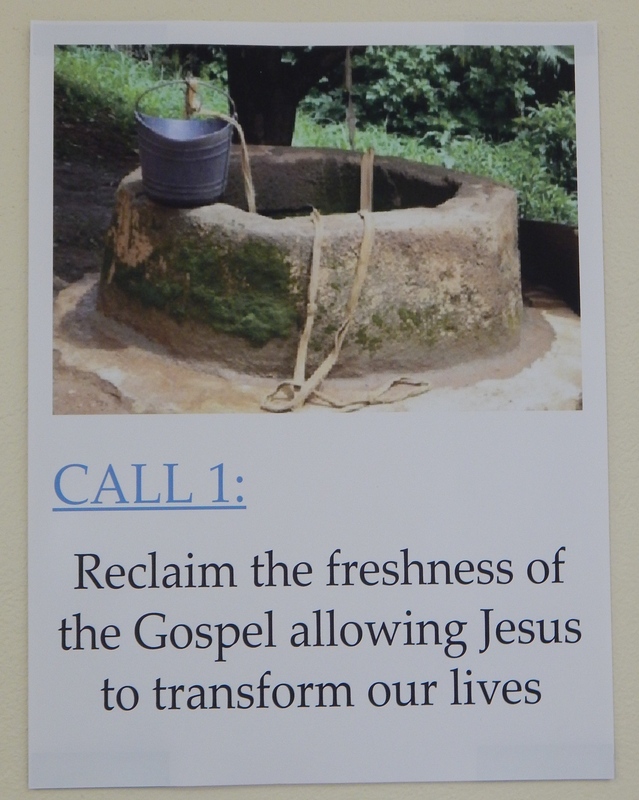 and generously shared in the spirit of the Gospel. use and disposal of anything of significant value. 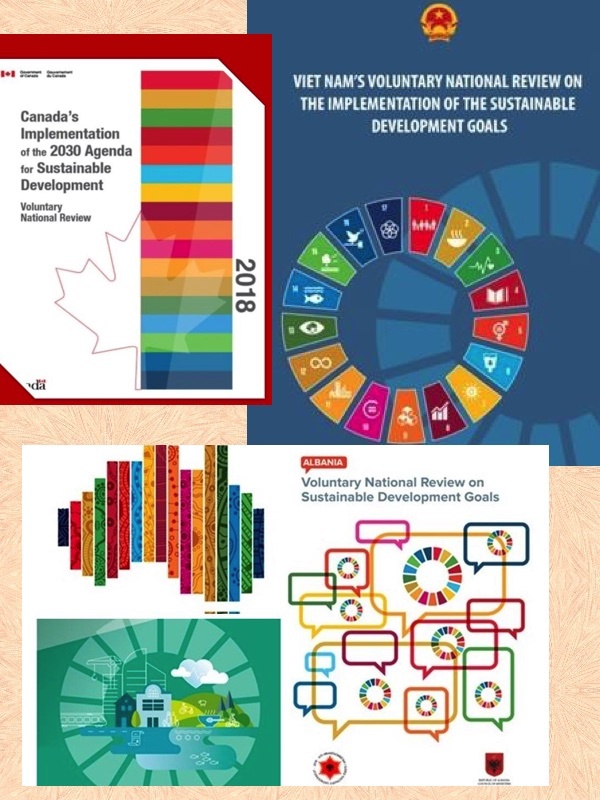 to sharing our Institute resources across provinces. to a responsible care and use of earth’s resources. 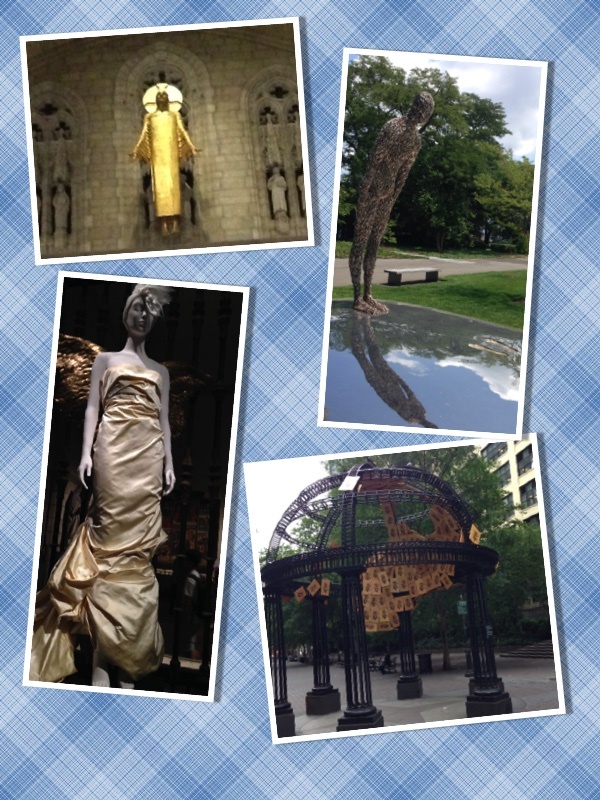 who work to preserve its beauty and dignity. The vow of poverty asks me to become interdependent – to let go of independence (financial) and risk becoming interdependent. Interdependence requires maturity and a willingness to learn how to give to others what they need but also to receive from others what I need. And how is the process of becoming interdependent going so far? For that answer, you’ll need to wait for Part II! Categories: #IBVM, Novitiate, Philippines | Tags: #community, #EvangelicalVows, #MaryWardWomen, #mission, #Novitiate, #poverty | Permalink. 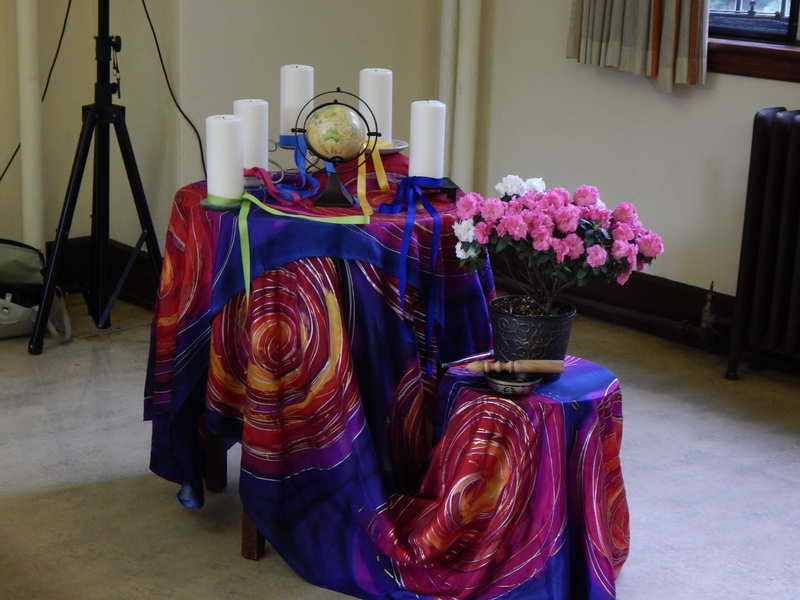 We began an inter-congregational novitiate program last week. 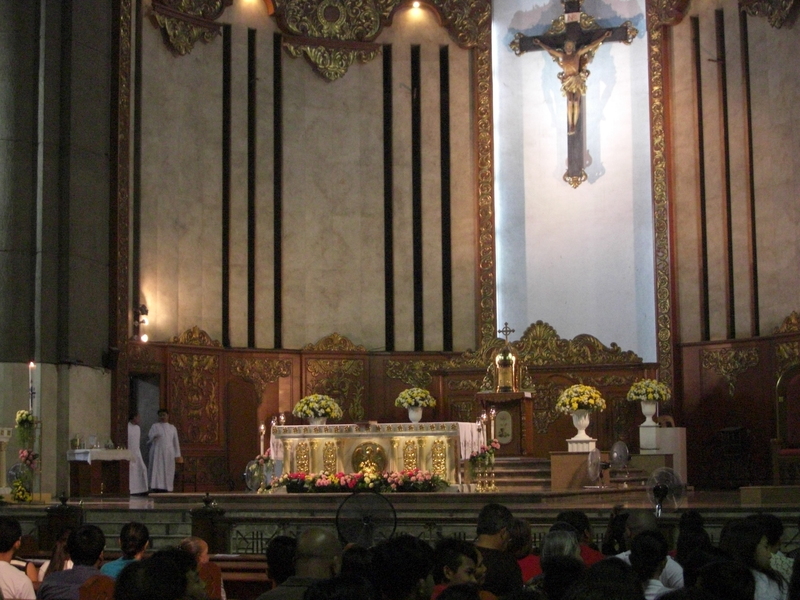 Nineteen different congregations (including the Missionary Society of St. Paul, Daughters of Wisdom, Redemptorists, Carmelites, and many more) from all over Asia, and parts of Africa, the Caribbean, South America, and Europe (Malta). Two of us are from North America: 1 Mexican and 1 Canadian. We range in age from 18 years to over 40 years. It’s a diverse group and large in size. 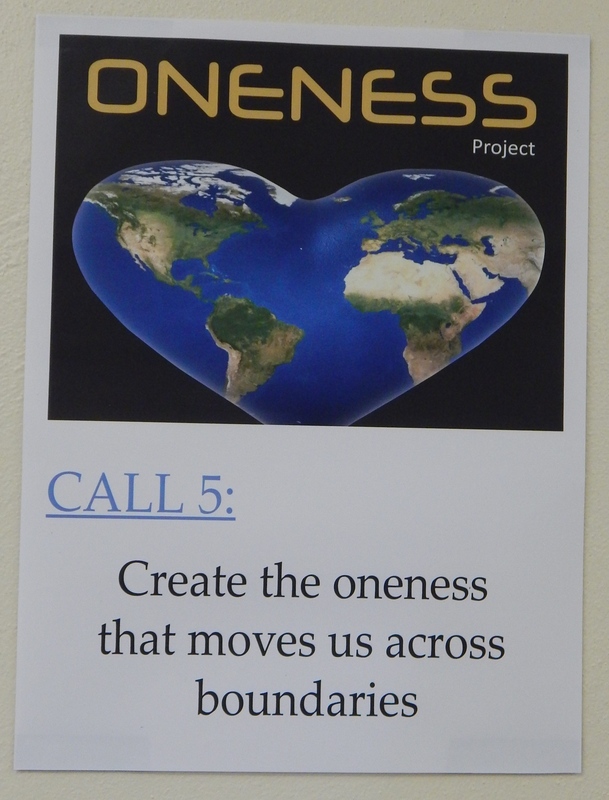 When we are all present, we number close to 90 participants. Our first week together was intense. None of us knew what to expect. We assumed ‘orientation’ meant orientation. But, in fact, several of us were immediately thrown into leadership roles and made to carry the program forward. At a pre-orientation meeting earlier in June, I was elected co-chair of our novices’ steering committee. It was a very random election, based on my introduction (name and country), and with no job description provided. When I arrived at the module last Tuesday, I was informed that the other co-chair (who was meant to be ’in charge’) wouldn’t be joining the group until August so until his arrival I would be the one to lead! I don’t consider myself a particularly spontaneous person but Tuesday morning I became intimately acquainted with the art of improvisation. All of a sudden I was the emcee for a three-day module I knew nothing about. I knew nothing about our schedule, our speakers, or even our purpose over the three days other than ‘orientation’. By the grace of God, and under the guidance of one of the priests who was the head of formation, I learned the ropes. Normally I would hate being in charge of something without knowing details in advance but I learned to go with the flow and to enjoy the experience. And, anyway, I wasn’t on my own in the deep end. Many others were there with me. Our haphazardly assembled steering committee came together to organize some of the necessary components of the module: prayers 3 times a day (morning, noon and closing), animation sessions (basically icebreaker songs or games), recaps of the day’s lesson, introductions of the speakers, and preparation of thank you cards and gifts. It was a tall order for a group of people who barely knew each other’s names but it was a great success and the collaboration ended up being a lot of fun. I love working in a team environment where others are energized and excited to contribute and I experienced such positive energy and enthusiasm in this group that it was a pleasure to work together. And I am sure it will continue to be a pleasure to work together for the next several months. I also learned something very important during the module (aside from two disturbing lessons about attitudes toward food safety and sanitation – but now’s not the time to get into that!). 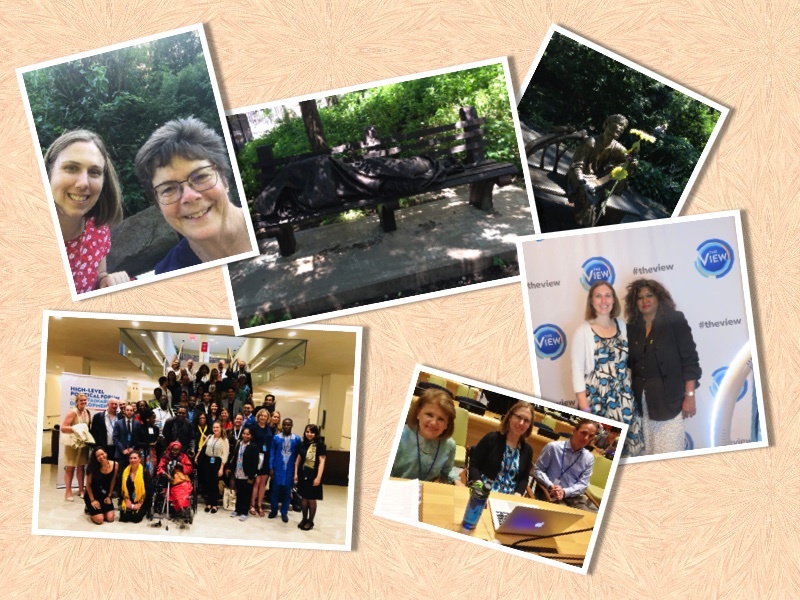 I learned how important it is for women to have a voice. Having a voice is something I take for granted in Canada. I don’t worry so much about sharing my opinion. I feel comfortable voicing my ideas and opinions at home and at work, and at church when the opportunity presents itself. However, I see that in this particular environment (the novitiate program), it is harder for women to be heard. Despite the fact that in the Philippines there are many strong women involved in politics, including past female Presidents, in religious life, or perhaps in the church, women’s voices are harder to hear. Men are being trained to be priests, to become preachers, and as such, they are given many opportunities to speak. Women do not have the same opportunities, nor is there the same expectation for women to speak. The majority of the men in our program appear to be very confident speakers. 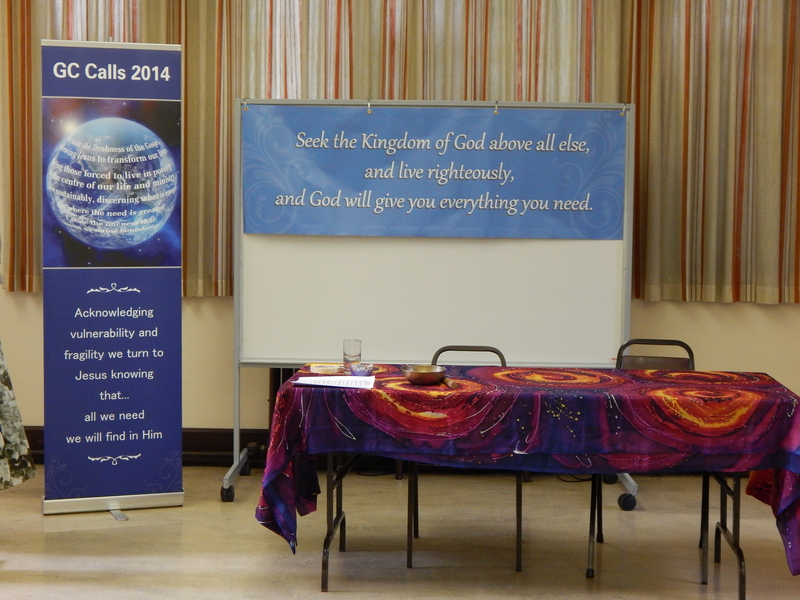 In fact, some of them seem to use the opportunity to respond to a question to give a quasi-sermon to the group. They are very friendly and helpful guys but there seems to be gender power imbalance at play (such as an unfortunate incident where a man asked a woman to wash his lunch dishes for him!) or at least a limited understanding of women’s roles and abilities. The women, it seems, need some coaxing in order to share their ideas and opinions. They struggle to volunteer their thoughts. I am not sure the reason why. It could be more than gender. It could be age. It could be feeling less confident speaking in English. Regardless of the reason, it’s so important that we hear their voices. 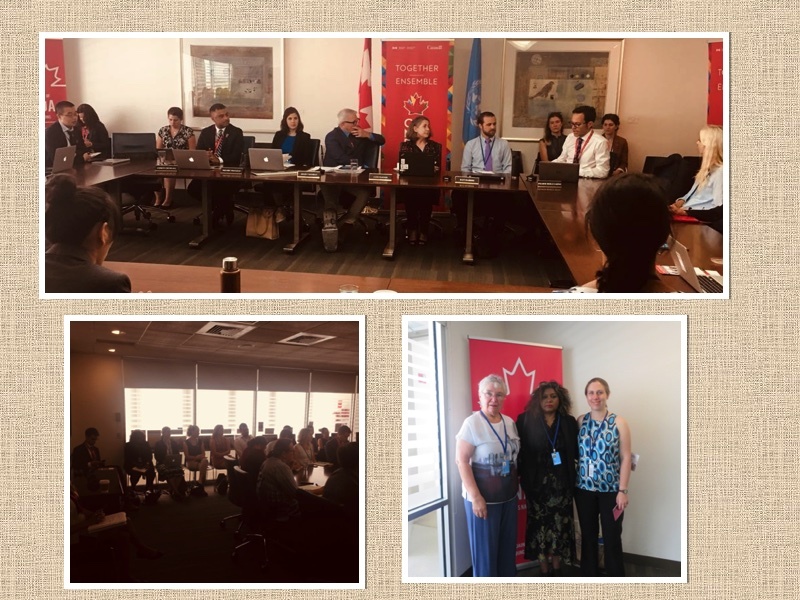 We have women from all around the world gathered here, women with diverse backgrounds and from diverse cultures, all with unique points of view that would enrich our dialogue. I like to think that my next couple of months (or however long it ends up being) in a visible leadership position will help to encourage the other women in the program to speak up. We’ve already had a conversation about it as an IBVM community and we are going to use every opportunity to participate and have a voice and to encourage the other women in the program to join in as well. If we all feel comfortable sharing our views, we will all come away from this time of formation with a rich experience of what it means for men and women in the church to collaborate and to learn from one another. Categories: EXODUS Novitiate Program, Novitiate, Philippines | Tags: #EXODUSProgram, #IBVM, #MaryWardWomen, #Novitiate | Permalink. I hope you’ve all had a beautiful and blessed Easter celebration! Our internet has been a bit wonky the last few days (it always seems to fade in and out unexpectedly on holidays) so I’m a bit late with the Easter Sunday photos. But here they are! 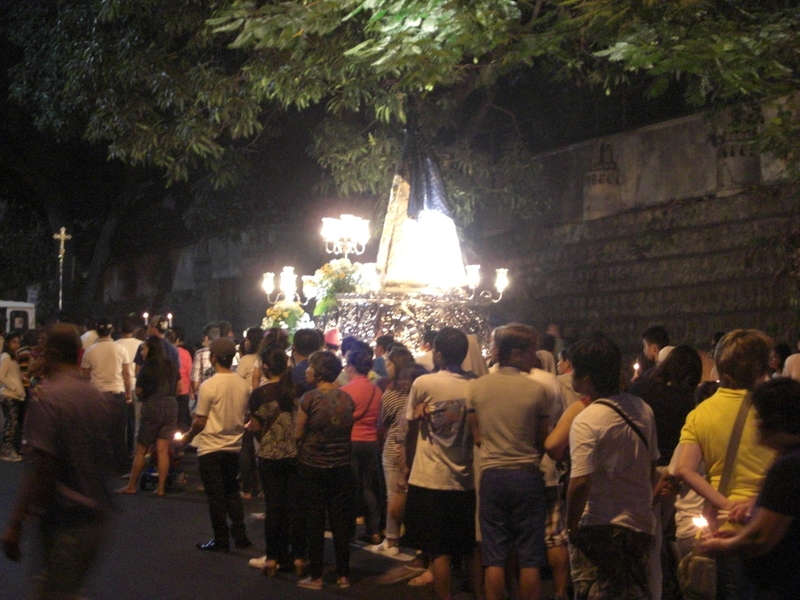 At 5:30am we arrived at the church just in time to witness a beautiful Filipino tradition:a procession enacting the Risen Christ meeting his mother. Although this encounter is not described in the bible, it surely happened that Jesus went to see his mother after the Resurrection. 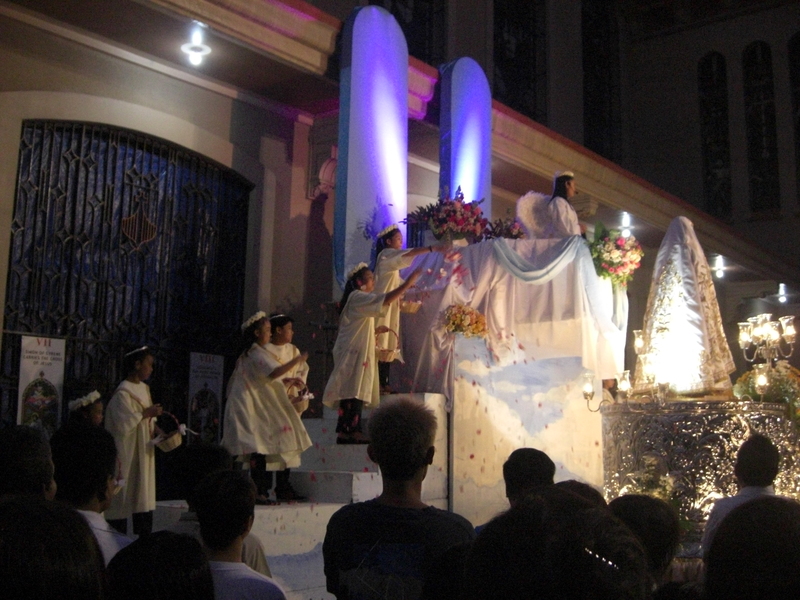 To re-enact this encounter, there are two simultaneous processions. 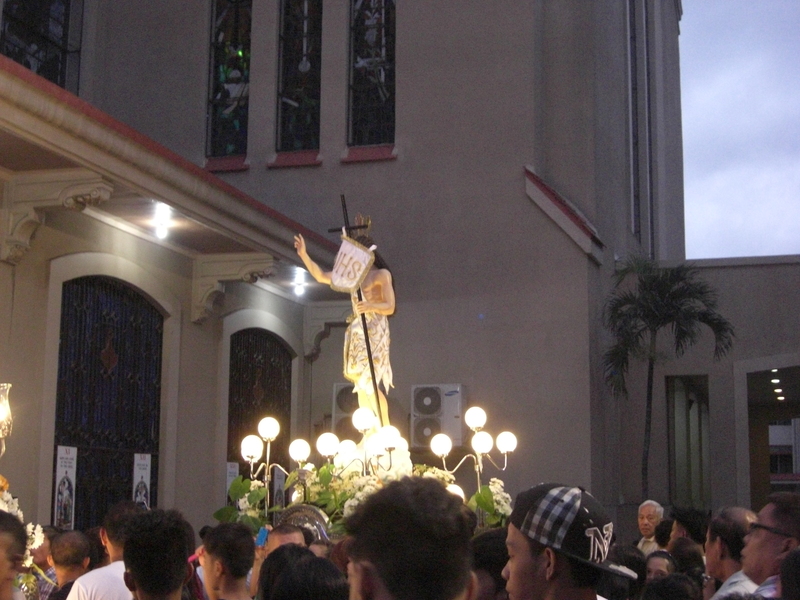 The men of the parish follow the Risen Christ around a particular section of the neighbourhood while the women follow Mary, Jesus’ mother. 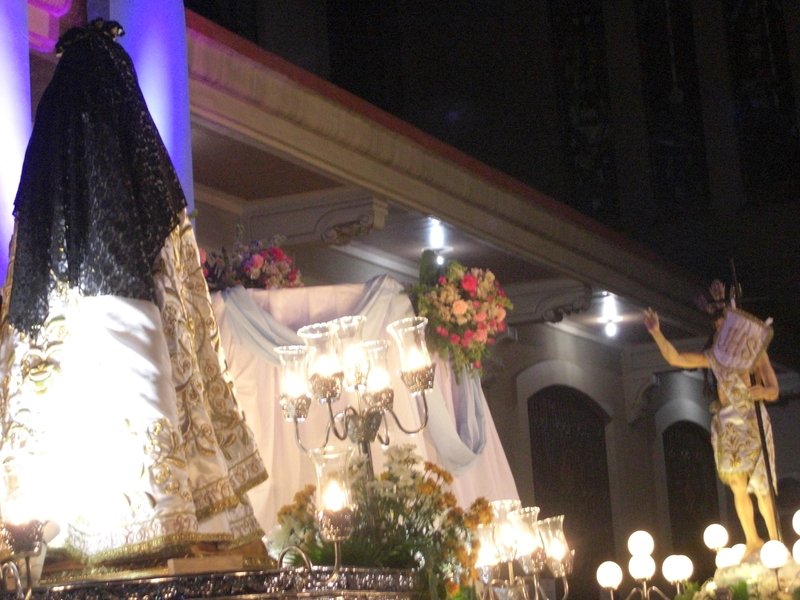 Mary, who is deep in mourning, wears a black veil. And then Jesus appears! At first in the distance. And then he draws closer. An angel announces their meeting. 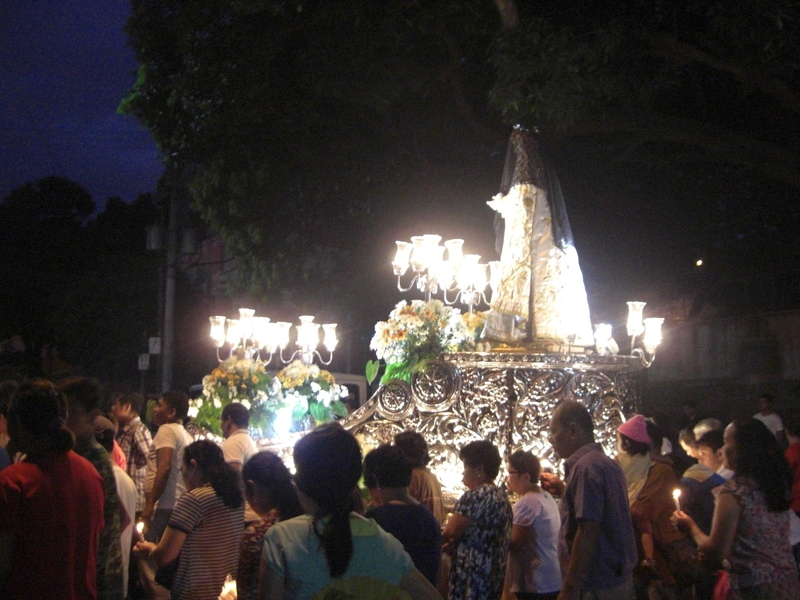 Mary’s veil is removed and she sees her son! There is much rejoicing and cheering! The angels send out a shower of flower petals upon the earth. 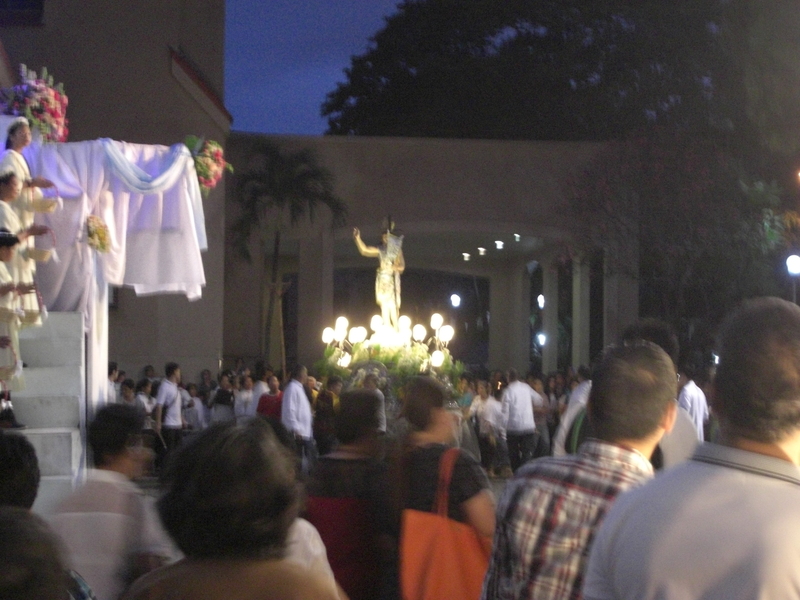 Filled with the joy of this encounter, we enter the church for the 6am Mass, passing by the Risen Christ. 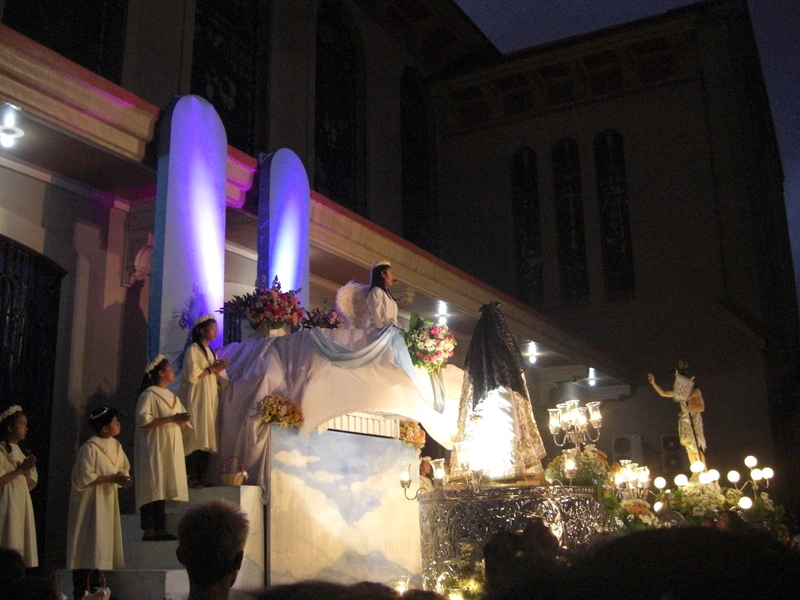 We enter the church which is decorated in Easter splendour and packed with people. 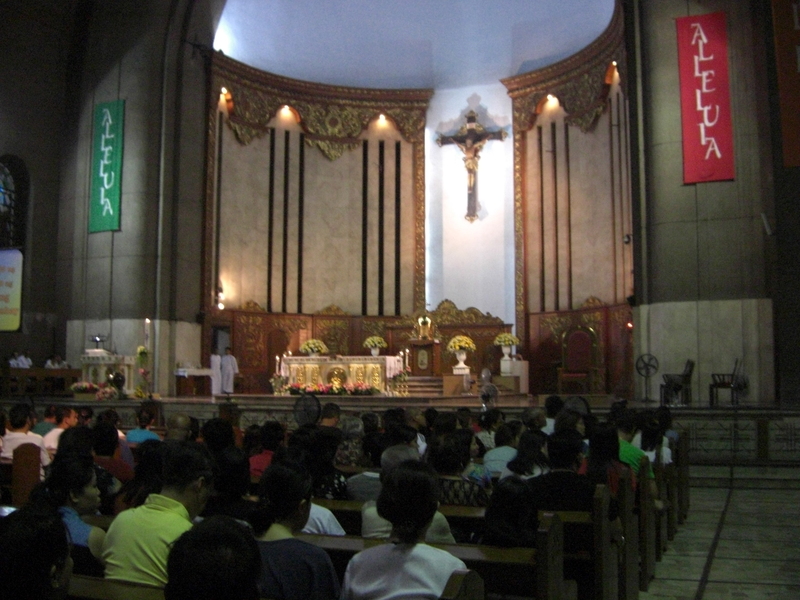 A tropical garden fills the sanctuary for Easter Sunday. After the Mass we continued the celebration at home – delicious coffee and Easter chocolates were consumed, and perhaps even a crepe or two (or three)! And in the afternoon we had a magnificent Easter banquet at Mary Ward House with 23 IBVM and CJ sisters, topped off with even more chocolate (including the brownies made before the Mother of all Vigils!!). A glorious Easter all around. 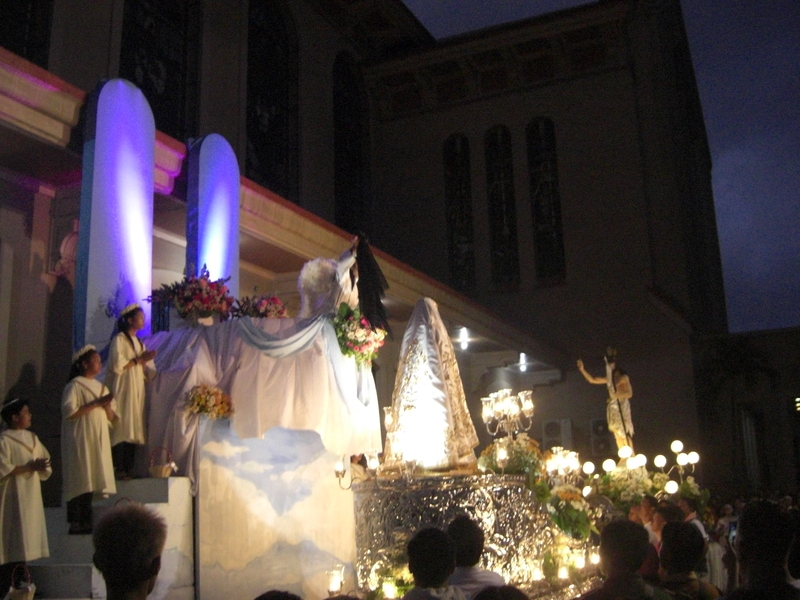 Categories: #MaryWard, Easter, Novitiate, Philippines | Tags: #Alleluia, #EasterinthePhilippines, #EasterJoy, #FilipinoTraditions, #HappyEaster, #HeisRisen, #MaryWardWomen, #Resurrection | Permalink.